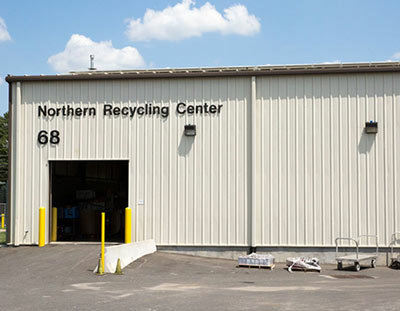 - Northern Recycling Center, located on New Hampshire Avenue (off Route 70) in Lakewood Township. - Southern Recycling Center, located at 379 Haywood Road near the State Motor Vehicle Inspection Station in Manahawkin, Stafford Township. 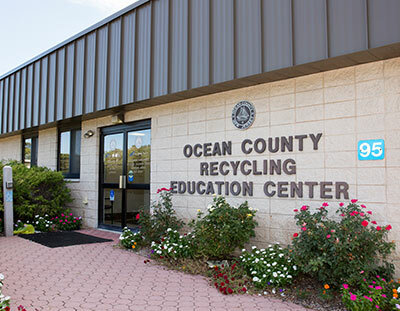 Both facilities house 24-hour Resident Drop-off Areas for single stream recyclables, aluminum and tin cans, glass containers, plastic beverage containers, newspaper, mixed paper and residential cardboard. Recycling is also available during regular hours of operation at both centers for batteries (rechargable, button, auto, boat), motor oil, oil filters, cooking grease, antifreeze, tires, empty steel paint cans, boat shrink wrap, books (soft and hardcover), phone books, computers, ink cartridges, cell phones, paint, leaves, light brush and Christmas trees. These items may be brought to Building 68 at the Northern Recycling Center and/or Building 105 at the Southern Recycling Center (excluding leaves and brush, which have separate drop-off areas). 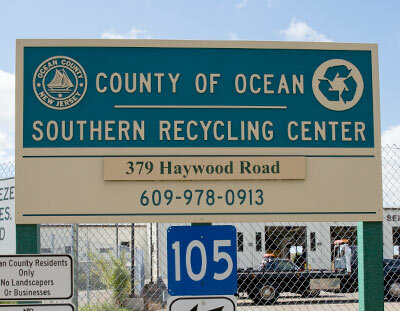 Hours of operation for the Northern and Southern Recycling Centers are 7:30 a.m. - 3:00 p.m. Monday through Saturday (Saturdays are for Ocean County residents only). 24-hour Resident Recycling Centers at both the Northern and Southern Centers remain open on all holidays.